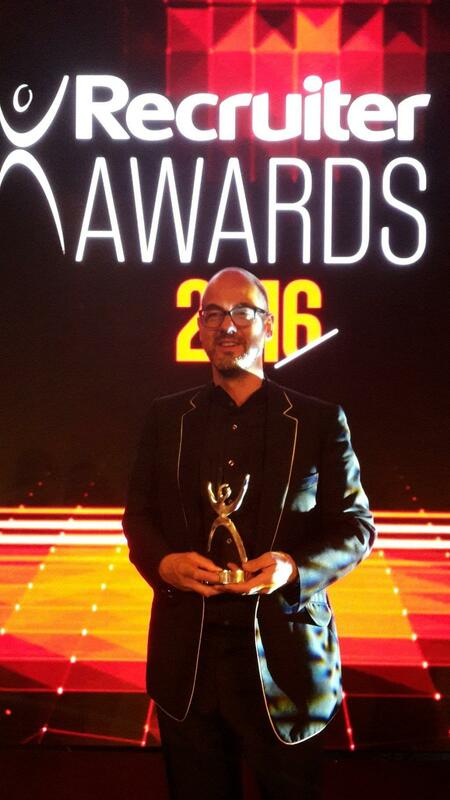 Tony Goodwin, Founder & CEO of Antal International, has won the prestigious award of “Entrepreneur of the Year” at the Recruiter Awards 2016 ceremony. Tony was shortlisted for the second year in succession and this year, his significant impact on the recruitment industry in terms of creativity, sustainability and profitability, was recognised with this award. The short list of nominees was released in March and Tony was competing with well-known and highly regarded peers from the industry. The competition was indeed fierce and business practices, professionalism and ethics of the highest standard were the main criteria measured when deciding on the ultimate winner. The Recruiter Awards are considered one of the prestigious highlights in the recruitment community calendar. Held on the evening of the 4th May at the Grosvenor House Hotel in London’s glamorous Mayfair the industry’s movers and shakers were recognised for their achievements and contribution throughout 2015. Antal International, founded in 1993, is a global management and professional recruitment specialist that offers more than just a local recruitment solution, due to the impressive range of sector-experienced industry leaders and traditional recruiters in more than 130 offices in 32 different countries around the globe, being one of the world’s largest and most successful privately owned international recruitment companies and globally recognised. Antal also offers to entrepreneurs or self started professionals, the opportunity to build and develop their own recruitment business as an Antal franchise, facilitating the acquisition and the use of the intellectual property.